Promote your name. Stimulate your trade. Reward your customers. Motivate your employees. Help your company’s performance. Break through the clutter of your competition. Contact us now and find out how easy it can be! After over 50 years of providing corporate motivation consulting and services, we’re now available online as your business consultant. Whether to evaluate a marketing plan or help stimulate new thinking, we can help you toss out those ‘problem solving’ approaches, clean out the cobwebs and get your organization moving in new and productive directions. 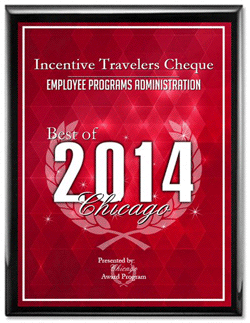 Incentive Travelers Cheque International® is a pioneer in individual incentive travel awards and individual traveler ‘cheques’. Our company assists businesses to create, execute, and manage individual and group incentive travel programs, as well as individual travelers that want Concierge level service for their personal vacations. In addition our merchandise, data processing, copy writing, art, and administration departments permits our clients to use one or more of our services to fulfill their marketing objectives. We have created and consulted with Hyatt Corporation, United and American Airlines, Celebrity, RCCL, Premier and Carnival Cruise Lines. Our company has been creating incentive travel programs since 1963 for clients such as Toyota, Mary Kay Cosmetics, Avon, Tupperware, Ford Motor Company, Volkswagen, Xerox, Helene Curtis, DK Family Learning, Creative Memories, Del Monte, and more. For sales-building incentive for employees or customers, for motivation programs from training to incentives, from keynotes to meeting planning, one call does it all. Incentive Travelers Cheque International® offers a full range of services that integrate an understanding and analysis of their business needs and current problems with specific solutions that are workable, affordable, and fit comfortably within the marketing process. And we’re your one-stop resource for motivation programs and awards. We are authorized dealers for over 6,000 merchandise suppliers. We are authorized advertising specialty distributors (one of the largest in the country). We are authorized incentive specialists for every individual incentive travel certificate (since 1982). We pioneered the individual incentive travel concept and created the Hyatt Nights Program as well as consulting with United, American, Carnival, Marriott, Ritz Carlton, Fairmont, Raffles, Swissotel, Sheraton, and others in the creation and application of their programs. The President of iTCheque is one of the very few CITE and MIP in the entire country. Contact us now and put this expertise to work for you! And your winners have the freedom to choose the gift they want or go where they want, with whom they want, whenever they want. Learn more about it!